Ajmer is bustling city, located 130 km southwest of Jaipur and just 14 km from the pilgrimage town of Pushkar. The city of Ajmer gets its name from “Ajay Meru”, which can be roughly translated as “invincible hill”. Home to a number of tourist places, Ajmer can be a perfect representation of the diversity of the Indian culture and ethics, and displays a perfect blend of religion, community, culture, etc., coexisting and flourishing in harmony. Ajmer remains a popular tourist attraction, in addition to being a pilgrimage centre for both Hindus and Muslims. The final resting place of the Sufi Saint, Khwaja Moinuddin Hasan Chisti, is visited by Muslims from all over the world; in fact, the Dargah is revered equally by both Hindus and Muslims. The city is surrounded by the expansive lake of Ana Sagar and the rugged hills of Aravalli. Although Ajmer Sharif Dargah, the shrine of Khwaja Muin-ud-din Chishti, remains as the most famous tourist places to visit in Ajmer, the city is also significantly known for the Jain religion and is home to an amazing golden Jain Temple. Ajmer is also a well-known learning centre. The Mayo College was one of India’s first schools that acted as the stepping stone for the British style of education and is now one of the popular places to visit in Ajmer. The city was founded by Raja Ajaypal Chauhan in the 7th century AD and the city remained as the epicentre of the Chauhan Dynasty till the 12th century AD. The Chauhan dynasty was responsible for the construction of the first hill fort of India, Taragarh, another must visit places in Ajmer. After the defeat of Prithviraj Chauhan by Mohammed Ghori, Ajmer become home to a number of dynasties. The Mughal Sultans particularly liked Ajmer due the presence of the holy Ajmer Sharif Dargah, the most popular tourist place in the city. Ajmer has a rich history and played host to the first meeting between the Mughal King Jahangir and the Ambassador of the Court of King James 1 of England, Sir Thomas Roe in 1616. The city was officially handed over to the British a few centuries later, making Ajmer the only region in Rajputana to be directly controlled by the British East India Company. Of the number of places to visit near Ajmer, Pushkar, which is about 14 kmremains as the most popular destination. Pushkar is a sacred spot for Hindus. The only known temple dedicated to Lord Brahma is situated in Pushkar and Hindus visit the city in large numbers during the month of Karthik to take a dip in the holy sarovar. Another tourist place near Ajmer that one can visit is the Lake Foy Sagar, an artificial lake. The lake was built by English Engineer Mr Foy in 1892 AD. The primary objective behind the construction of the lake was to provide famine relief through employment for the locals. The lake offers some breath taking views of the Aravalli range. Ajmer is a melting pot of culture. The places to see in Ajmer are proof of this, from the Dargah to the Jain Temple. This mingling of cultures has influenced the city’s eating scene as well. One can enjoy traditional Rajasthani cuisine along with dishes influenced by the Mughal and British cultures. One can also find street vendors dishing out everyone’s favourite street food. The best time visit Ajmer is between October and February. The weather remains very pleasant during this time. The daytime temperature during this time encourages visits to various tourist places to see in Ajmer. The summer months, from March to May, are best to be avoided, as the temperature can easily cross 40° C, which is not conducive for visiting places of attractions in Ajmer. One can contact the tourist offices and book a suitable Ajmer tour package to fully enjoy the various tourist places in Ajmer. Most Ajmer tour packages will include conveyance and accommodation. Come explore the wonders and sites that Ajmer has to offer you. There’s always something to see in Rajasthan. This is a Sufi shrine which encloses the ‘maqbara’ (grave) of Garib Nawaz, the Sufi saint Khwaja Moinuddin Chisti. Built in the 13th century, the shrine is popular among people of all faiths who flock here to have their prayers answered. The shrine has three gates – the main gate or the Nizam gate, the Shah Jahan gate erected by the Mughal Emperor and the Buland Darwaza. Another big draw at this holy shrine is the sacred and scrumptious food that is served to devotees. Cooked in giant cauldrons known as ‘degs’, devotees gather in throngs to be blessed by this prasad. The Adhai Din Ka Jhonpda was originally built to function as a Sanskrit college but was later converted into a mosque by Sultan Ghori in 1198 AD. An impressive blend of Indo-Islamic architecture, the structure was further beautified by Sultan Iltutmish in 1213 AD. Legend has it that the mosque is known as Adhai din ka Jhonpda (literally meaning, The Hut of Two and a Half Days) because of a two and half day fair held here during Urs in the 18th century. Mayo College is one of India’s oldest independent boarding schools. Founded in 1875, and named after Richard Bourke, the 6th Earl of Mayo, Mayo College was set up to provide the scions of India’s princely states with an education similar to that provided by the Eton College in Britain. John Lockwood Kipling, father of Nobel Laureate, Rudyard Kipling, as principal of Mayo College, furnished the design of the Coat of Arms which shows a Rajput and a Bhil warrior. The college building is one of the finest extant examples of Indo-Saracenic style of architecture. Spread over an area of over five bheegas (or over two acres) at Ajay Nagar, the Sai Baba Temple in Ajmer was constructed by Suresh K Lal, a resident of the Garib Nawaz City in 1999. It’s one of the most recent pieces of architecture and is very popular among all Sai Baba devotees. The temple is built with the purest form of marble that possesses the unique quality of a translucent stone, allowing light to pass through it. Every Sai Baba disciple should definitely visit this shrine once in their lifetime. The Ajmer Government Museum serves as one of the prime tourist destinations in Ajmer. The museum is housed within the magnificent fortified palace of the legendary Mughal Emperor Akbar, which was built in 1570. The museum is also known as Bharatpur Museum and is home to a rich collection of archaeological artefacts. Along with stone sculptures, inscriptions and armours, it features the finest paintings of the previous Maharajas of Bharatpur. Gateway of Taragarh Fort is the imposing main gate of Taragarh fort which is built on a crest of a hill. The main gateway of the Taragarh, which consists of two colossal bastions on both sides with strong guard rooms, has sculptures of elephants adorning it. The main highlights of this once magnificent fort are its water reservoirs and the Bhim Burj, on which the canon called Garbh Gunjam (Thunder from the Womb) was mounted. There is also the magnificent Rani Mahal with its stained windows and murals, which used to house the wives of the rulers. All this makes the Taragarh Fort a nonpareil example of Rajaputana architecture that’s also a major attraction for tourists visiting Ajmer. Fort is also known for Dargah of Hazrat Miran Sayyed Husain Khangswar(Miran Sahib) . Kishangarh Fort is a beautiful fort located in Kishangarh, Rajasthan. On visiting the fort, one will see jails, granaries, armouries and other significant buildings present inside of it. The Durbar Hall is its biggest structure, and was the place where the kings carried out their official meetings on a daily basis. And when it comes to the most attractive place inside the fort, it has got to be Phool Mahal which showcases the splendour of the kings from the Rathore clan in a glorious manner, with gorgeous murals and frescos adorning its walls. Alongside the fort, a few lakes like Gundu lav talab & Hamir Sagar are located which serve as a great picnic spot. If you want to revisit history, Kishangarh Fort is a place you ought to visit when in Rajasthan. Near by Kishangarh one can also see Nimbark Peeth & Chor Baori -Salemabad(20Km. ), Roopangarh(25Km. ), Ruins of Karkeri fort and Cenotaphs of Shri Jawan Singh-Karkeri (30Km. via Salemabad), Group of old Makbaras-Tukda(7 Km. ), Tilonia (20 Km.) ,Pitambar Ki Gaal-Silora (7 Km.) & Ruins of old Palace or Sarai- Chatari . Built by the Jain community in 2005 in the memory of Jain Acharya Tulsi, Pragya Shikhar is a temple made completely out of black granite. It is located in Todgarh, which is a scenic village set in the Aravalis. Dr. APJ Abdul Kalam inaugurated it, and it was erected by an NGO. Pragya Shikhar is a serene place which one should definitely visit to revel in the peaceful environment of the temple. Other places to see in Todgarh & around are Old C.N.I. Church, Katar Ghati, Dudhaleshwar Mahadev, Bheel beri,& Raoli-Todgarh wild life Sanctuary. Ajmer is a city that has seen major influence from the British in its past. The British left their legacy in many forms in Ajmer, some of which are in the form of educational institutions and architectural buildings in the city. While a couple of these buildings are located in the heart of Ajmer, one that immediately catches the eye of the visitor is the Victoria Jubilee Clock Tower. Located just opposite the railway station in Ajmer, the monument is an imposing clock tower that was built back in 1887. It is particularly well-known for its architectural beauty, and is quite an impressive example of British architecture, reminding onlookers of a smaller version of the famous Big Ben. Prithvi Raj Smarak is a memorial made in the honour of the brave Rajput chief, Prithvi Raj Chauhan III. Regarded as the epitome of devotion and courage, he was the last ruler of the Chauhan lineage and was enthroned to rule over the twin capitals of the Ajmer and Delhi, in 12 th century. The memorial exhibits the statue of Prithvi Raj III seated on his horse, made in black stone. The horse has one of its front hooves up in the air, as if charging forward. The memorial stands atop a hill, surrounded by the Aravalli range, giving visitors a panoramic view of the city of Ajmer. The memorial also has a garden adjacent to it, wherein tourists can sit and relax. The white marble pavilions present on the south eastern embankment of the beautiful Ana Sagar Lake in Ajmer are called as Anasagar Baradari. It is a Mughal structure that’s wrapped around water bodies in a garden-like setting. These pavilions boast of a rich history; these were a section of a pleasure garden named Daulat Bagh that was set up by Shah Jahan and Jehangir. During British rule, these five pavilions doubled up as offices. Today, you can see them restored as bona fide pavilions, along with ‘hamam’, the royal bath which is also present at the same place. Anasagar Baradari is a serene place - just sitting by the pavilions and admiring the surroundings makes your heart feel at peace. This place is a must-visit for the calmness and rich history that the place has to offer. Paying reverence to the mighty and brave has been a practice that’s ingrained into the very soul of Rajasthan, and the same can be observed in the city of Ajmer too. Walking around the city, you are likely to come around structures and memorials, which offer homage to great warriors and martyrs, born in the princely state. One such structure established in commemoration of the sacrifices of brave souls is the Shahid Smarak in Ajmer. Located right in front of the railway station, this memorial stands in plain sight and is quite easy to reach. Local authorities and townsfolk gather around the Shahid Smarak on numerous occasions to pay tribute to the martyrs. Decorated with colourful lights and fountains, the memorial makes for a beautiful sight to behold. Be a part of the festivities and traditions that Ajmer has to offer. It’s always a celebration in Rajasthan. Engage in the many activities, tours and adventures that await you in Ajmer .There’s always something to do in Rajasthan. Ajmer is well-connected via both, the road and rail network. The nearest airport is Kishangarh Airport, which is about 30 kilometres away and helps Ajmer remain well-connected with major Indian cities. One can easily pre-book a cab or hire one from the taxi stands outside the airport. The journey will take around 39 mins. Buses from the state capital and from other cities also ply to Ajmer regularly. Government run buses run between Jaipur and Ajmer throughout the day. Private operators also ply on the route. There are also less-frequent coach services running between Ajmer and Delhi. One can also use the cloakroom at the main bus stand. 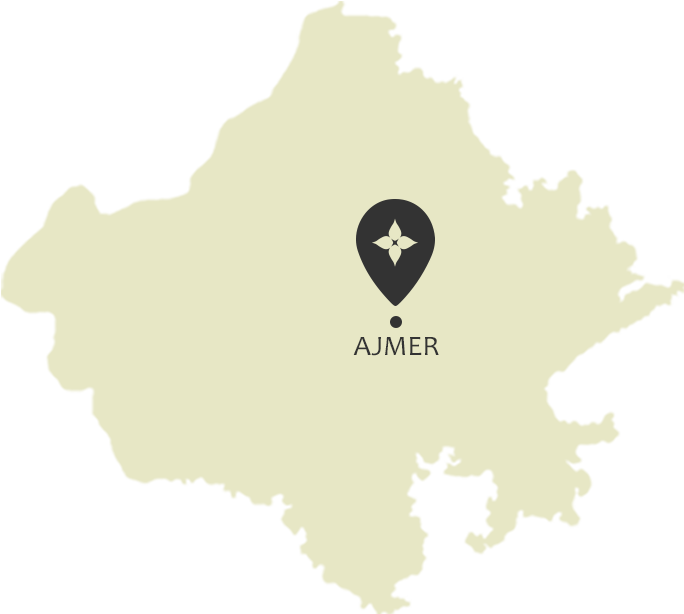 Ajmer is located on the Delhi-Jaipur-Marwar-Ahmedabad-Mumbai railway line. It is well connected by rail as most trains on this route halt at Ajmer.